Stuttgart/Essen. Increasing awareness of sustainability and honing international perspectives are key components in training prospective architects. The only way to expand your own horizons is to think across borders. The non-profit Sto Foundation is promoting the development of these skills with its summer school competition, which took place this year for the fifth time. The requirement was internationally-oriented courses on "sustainability and energy-efficient construction types", and entry was open to all faculties of architecture and civil engineering in Germany. Chairman of the Foundation Board, Prof. Peter Cheret, University of Stuttgart, presided over the jury, who assessed recent submissions from across all of Germany. The four victors fulfilled the Foundation's requirements of internationality, stringent design, and high public profile in an exemplary manner, and were awarded a total of EUR 40 000. Students on the international master programme are designing a teaching and reading room for the inhabitants of the Ezbet Abu Quarn informal settlement in Cairo, and are doing so together with students of the Ain Shams University and the local inhabitants using an ecological and sustainable method of construction. A temporary meeting point is being created on the border of the village Beit Zafafa (Palestine) and the neighbouring Katamonium (Jewish part of Jerusalem) under the artistic direction of Matan Israeli. A stall selling melons is being built, which is to serve as a meeting point for cultural events. 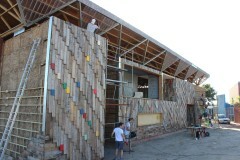 Voluntary helpers from both communities and students of the TU Berlin are carrying out its construction. The fifth and last construction stage of the extension to the Guga S'Thebe cultural centre is underway, which is to include a children's and youth theatre in Langa, Cape Town. Over 200 students of the RWTH Aachen, the Peter Behrens School of Architecture in Düsseldorf, Georgia Tech in Atlanta, and the University of Cape Town are taking part in construction. Students of the TU Berlin and craftsmen (refugees and local people) are planning and creating a communal kitchen including a multifunctional space.